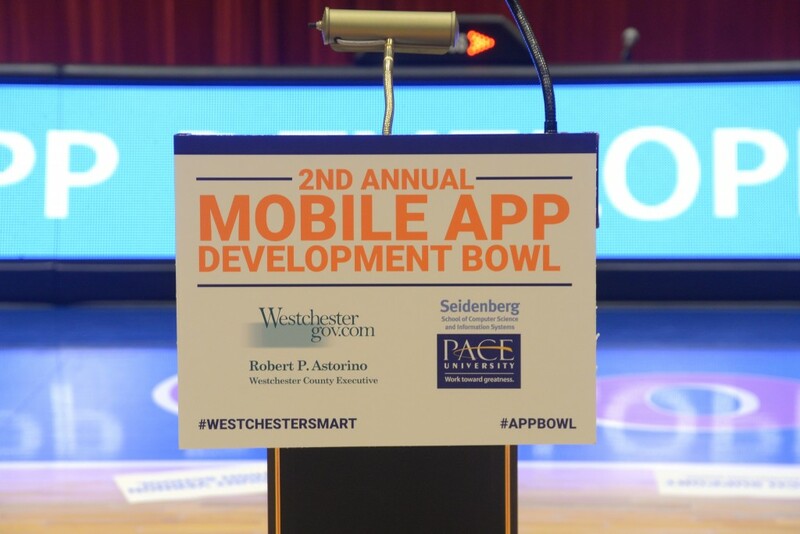 Friday February 26 was a great day at Pace University as hundreds of high school and college students participated at the second annual Westchester SMART Mobile App Development Bowl. This year’s kickoff event was bigger than ever, with around 260 contestants from 36 high schools and colleges coming together to design mobile applications for senior citizens. The challenge was to design an app to help senior citizens deal with a problem they experience in their everyday lives, whether that problem stems from their relationship with technology itself or whether technology can simply be used to solve an unrelated issue. The event is sponsored by Westchester County Executive Robert P. Astorino in conjunction with The Seidenberg School. After an incredible pep rally from The Marching Cobras of Westchester, the teams attended workshops and got to work developing their apps. The resulting apps will be presented to a panel of judges on April 15th – so if you missed the kickoff, come in April to check out what everybody did! Winners will be announced on April 15th at the final presentation, which will be held at Pace University’s Pleasantville campus. Cash prizes, paid internships and publishing apps through app stores all on the table. The #WestchesterSmart #AppBowl (tweet us!) was organized by Seidenberg faculty, staff, and students. Dr. Jean Coppola is our champion of gerontechnology research and was the Lead Faculty & Advisor. Deth Sao did Development & Partnership Relations and graduate student Adil Hasan was the project manager – well done, folks! See you on April 15th for the final event!